“No matter what happens, I will do what he told me. I will stay safe, and stay free. Let me preface my review by saying that I am not a huge fan of sci-fi novels. They seem to be all the rage in young adult fiction lately, so I read my fair share of them, but they never really seem to push my buttons. Time travel, hacking, space adventures, and all of the other common themes tend to make me yawn, and yet I keep hoping that I'll stumble across one I genuinely have fun with. Well folks, this is the one. 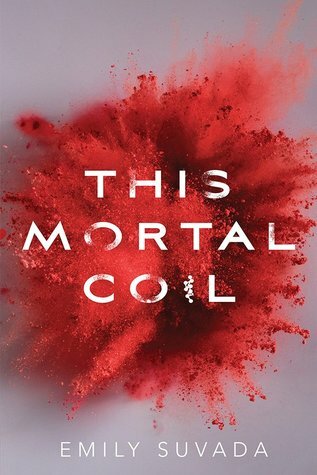 This Mortal Coil takes place in a futuristic world where (a) people can change their genes willy-nilly to suit their bodily or superficial needs and (b) a horrific plague has stolen billions of lives and left the world in chaos. Sure, the zombie apocalypse/world-wide disease plotline is a bit overdone, but Suvada takes it all to a new level with the concept of gene-hacking. I shockingly found myself intrigued by descriptions of scientific advancements, and the fantastic characters take an overdone trope and turn it into something thoroughly enjoyable. A perfect blend of romance, action, and mystery, the novel takes you through loop after loop as young Cat attempts to unravel the threads her father has left behind. He told her not to trust the organization that's claimed power since the outbreak of the plague, and yet it seems his motives might not have been as pure as she hoped. You'll gasp, laugh, and devour each page as she unearths countless horrifying secrets (and banters with a hunky bodyguard who is more than meets the eye). Be warned: the ending will leave you shaking your head in disbelief. I haven't stumbled across a plot-twist as startling and thought-provoking as this one in years. That in itself was enough incentive to give This Mortal Coil a stellar rating. I will admit that the lengthy descriptions of gene editing and vaccine production flew a little over my head, and I ended up skimming more than a few paragraphs due to a lack of interest. That's probably why I couldn't give the novel five stars, but it certainly didn't keep me from appreciating the genius behind Suvada's novel. Overall, two thumbs up to this heart-pounding 2017 release. It's got great characters, a plot that'll keep you guessing, and a whole lot of twists and turns. This novel was one big rollercoaster, so buckle your seatbelt and hang on tight: it's gonna be a bumpy ride.